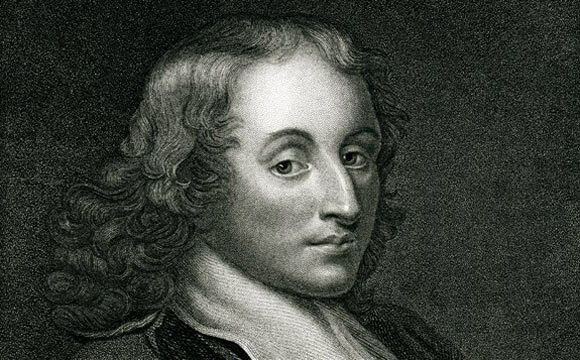 Blaise Pascal was a famous French mathematician, physicist and inventor of the 17th century. He was born on June 19, 1623 to Etienne and Antoinette Pascal. Etienne was a tax collector and talented mathematician and Antoinette died when Blaise was a baby, as a result of which he was very close to his elder sisters who raised him. The family moved to Paris in 1631. Blaise was educated at home by his father who kept him away from the study of mathematics for fear that he would become too focused on it to study anything else. He reportedly removed all mathematical texts from the house and had him focus on classical languages such as Latin and Greek. However, this made Blaise even more fascinated by mathematics and at the age of 12 he began to study geometry on his own. Because he was not formally taught mathematics, Pascal made up his own terms as he went along and quickly absorbed any information he could get his hands on. When his father realized his son’s potential, he introduced him to the texts of Euclid. Pascal pursued this study whole heartedly and it was soon apparent that he was a mathematical prodigy. At the age of 16 he accompanied his father to a meeting of the mathematical academy in Paris where he presented his theories to a gathering of the foremost mathematical geniuses of the time and they were well received by a captivated audience. In 1640, Etienne moved the family to Rouen, where Pascal published his first paper titled “Essay on Conic Sections”. Here he also invented a calculator to help his father in tax collection calculations. He called it “Pascaline” and it consisted of a wheel with eight movable dials, which aided in addition, subtraction, multiplication and division. He improved the original design and it temporarily went into production but the venture was never a commercial success. Pascal suffered a serious injury in 1646 which left him bed ridden for a long time and it was during this time that he embraced religion. During his illness, he reportedly had religious visions and produced his major literary religious text called “The Provincial Letters”. Later period French writers such as Voltaire and Jean Jacques Rousseau were influenced by Pascal’s writings. In later life, Pascal became interested in physical sciences and conducted various experiments on atmospheric pressure. One such experiment was to estimate atmospheric pressure based on its weight. In honor of his contributions, the unit of atmospheric pressure has been named the “Pascal” as well as a programming language and an important principle of hydrostatics. Pascal’s most important contribution has been in the field of probability theory. He conceived that the likelihood of outcomes of events was fixed, rather than random. He developed his theory through communication with the famous mathematician Pierre de Fermat, as well as his own experiments using a six sided die. Pascal’s probability theory is used in economics, actuarial sciences and many other fields and it significantly altered the way that risk taking and decision making was viewed. Towards the end of his life, Blaise Pascal became severely ill, especially after the death of his sister Jacqueline which left him emotionally fraught. He died in Paris in August 1662 uttering his last words “May God never abandon me”. He is remembered not only for being an influential scientist and mathematician, but as a master of French prose and one of the most important authors of the French Classical Period.